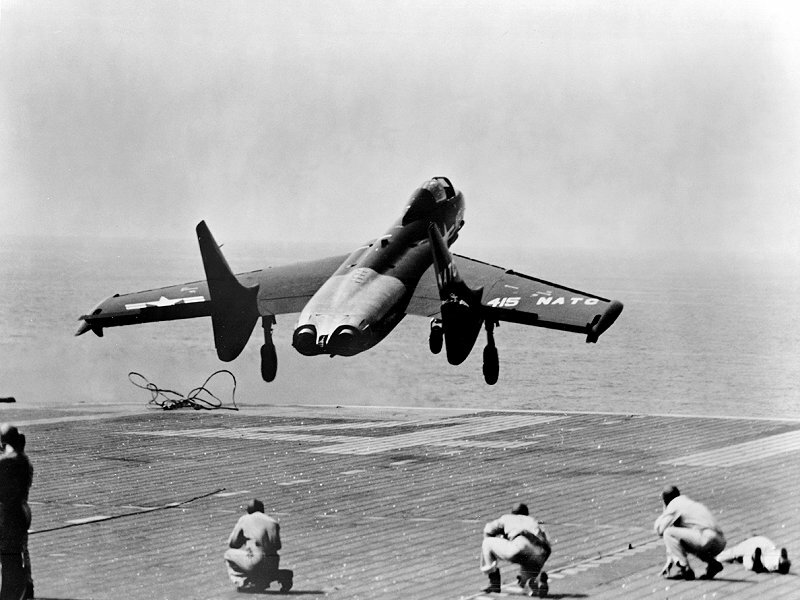 The Cutlass was Vought's entry to a U.S. Navy competition for a new carrier-capable day fighter, opened on 1 June 1945. Former Messerschmitt AG senior designer Waldemar Voigt, who supervised the development of numerous experimental jet fighters in Nazi Germany, contributed to its design with his experience in the development of the Messerschmitt P.1110 and P.1112 projects. 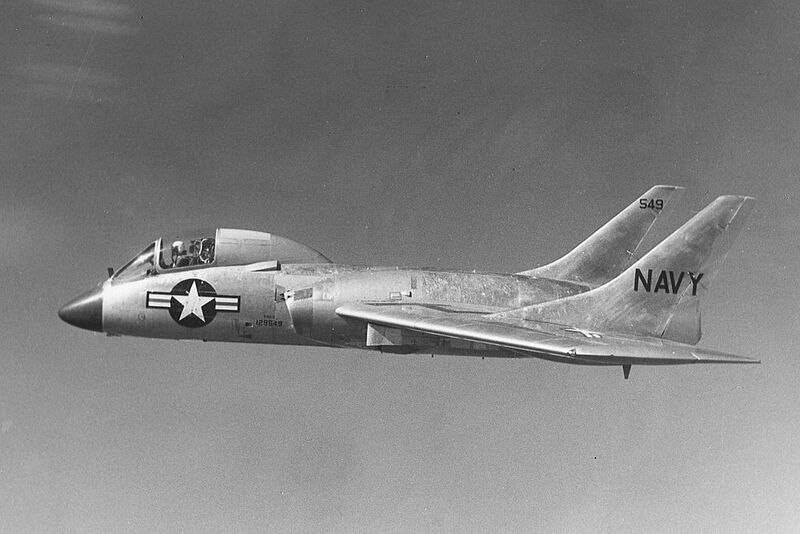 Vought F7U Cutlass on nuolisiipinen, kahta suihkumoottoria käyttänyt yhdysvaltalainen tukialushävittäjä. Konetyypin ensilento oli 29. syyskuuta 1948. Suunnittelijoilla lienee ollut käytettävissä saksalaisilta, kuten Aradolta, hankittua tiedustelutietoa. Siiven nuolikulma on 38 astetta. Koneessa ei ole korkeusvakaajia mutta siinä on kaksi sivuvakaajaa. Sen voimanlähteenä on kaksi Westinghouse J46-WE-8A-suihkuturbiinia, joissa on jälkipoltto. Viimeisin kehitysversio oli F7U-3. Sen huippunopeus oli 1 064 km/h, ja kone kykeni saavuttamaan 12 190 m toimintakorkeuden. Koneen aseistuksena on neljä 20 mm lentokonetykkiä, ja siipien alapuoliset ripustukset rakettiaseistukselle. The requirements were for an aircraft that was able to fly at 600 miles per hour (970 km/h) at 40,000 feet (12,000 m). The design featured broad chord, low aspect ratio, swept wings, with twin wing-mounted tail fins either side of a short fuselage. The cockpit was situated well forward to provide good visibility for the pilot during aircraft carrier approaches. 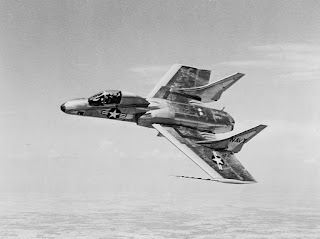 The design was given the company type number of V-346 and then the official designation of "F7U" when it was announced the winner of the competition. 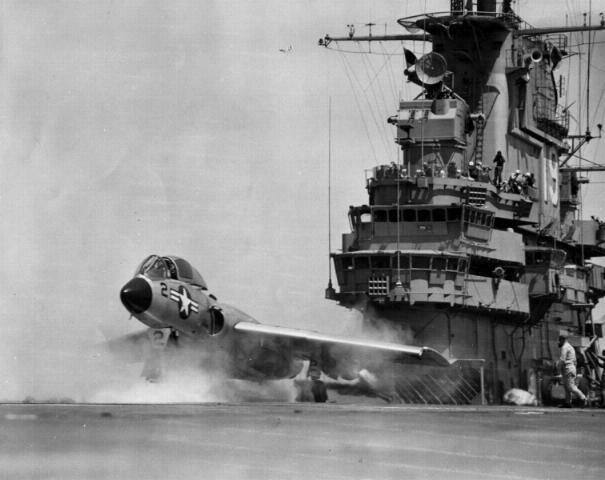 Pitch and roll control was provided by elevons, though Vought called these surfaces "ailevators" at the time. Slats were fitted to the entire span of the leading edge. All controls were hydraulically-powered. The very long nose landing gear strut required for high angle of attack takeoffs was incredibly stout, however the high stresses of barrier engagements, and side-loads imposed during early deployment carrier landings caused failure of the retract cylinder's internal down-locks, causing nose gear failure and resultant spinal injuries to the pilot. 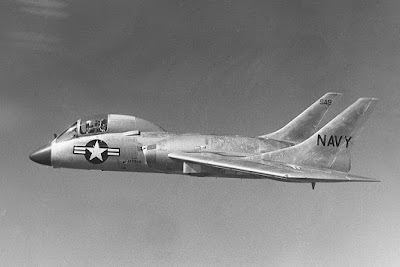 The F7U was also largely let down by its underpowered Westinghouse J34 turbojets, an engine that some pilots liked to say "put out less heat than Westinghouse's toasters." 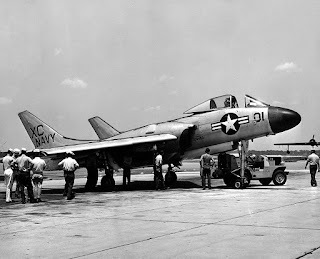 Naval aviators called the F7U the "Gutless Cutlass" and/or the "Ensign Eliminator" or, in kinder moments, the "Praying Mantis". Ramp strike of Vought F7U-3 Cutlass "412" of VF-124 on Hancock on 14 July 1955. 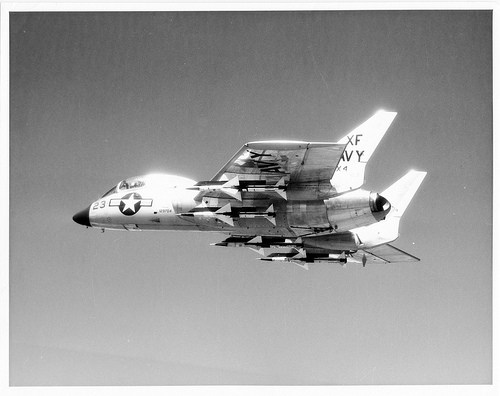 LCDR Jay T. Alkire (XO of USN's VF-124 'Stingarees') was killed in the crash, and several deck crew were injured. Production orders were placed for the F7U-1 in a specification very close to the prototypes, and further developed F7U-2 and F7U-3 versions with more powerful engines. Because of development problems with the powerplant, however, the F7U-2 would never be built, while the F7U-3 would incorporate many refinements suggested by tests of the -1. 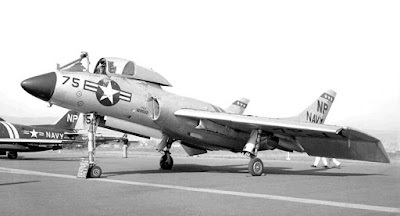 The first 16 F7U-3s had non-afterburning Allison J35-29 engines. 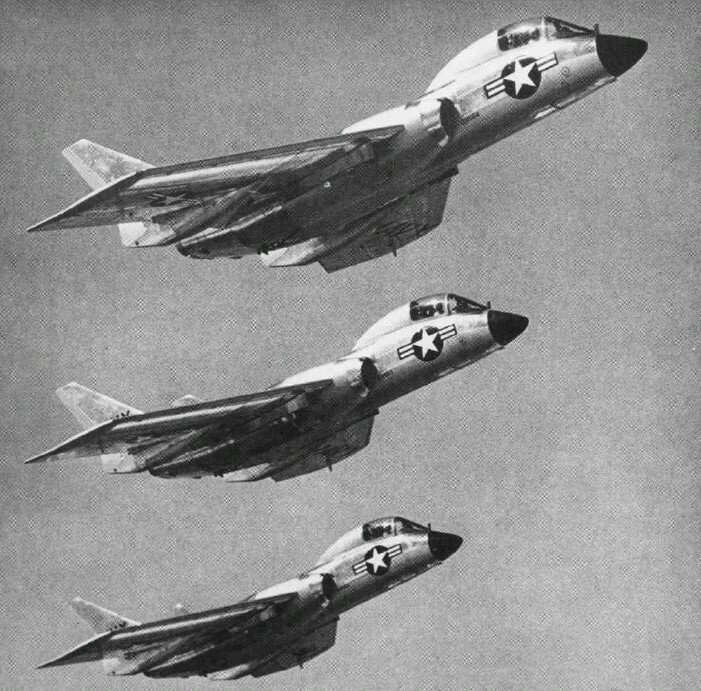 The -3, with its Westinghouse J46-WE-8B turbojets, would eventually become the definitive production version, with 288 aircraft equipping 13 U.S. Navy squadrons. 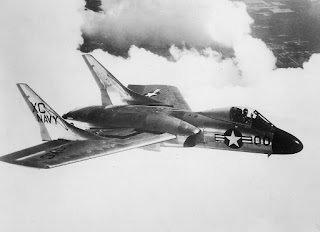 Further development stopped once the Vought F8U Crusader flew. The F7U's performance suffered due to a lack of sufficient engine thrust; consequently, its carrier landing and takeoff performance was notoriously poor. The J35 was known to flame out in rain, a very serious fault. VA-212, USS Bon Homme Richard, August 1956 – February 1957. 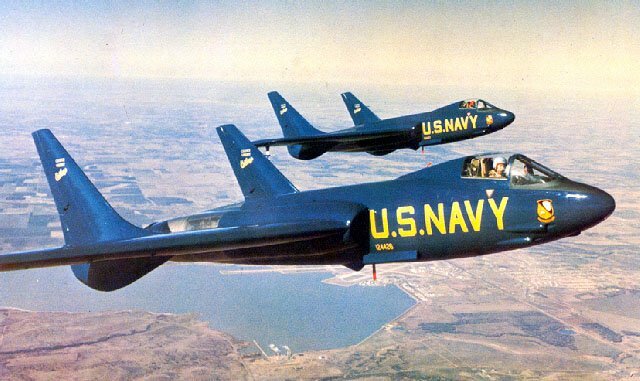 The Navy Flight Demonstration Squadron, the Blue Angels, flew two F7U-1 Cutlasses (BuNos 124426 & 124427) as a side demonstration during their 1953 show season in an effort to promote the new aircraft, but did not use them as part of their regular formation demonstration. Both the pilots and ground crews found the aircraft generally unsatisfactory, and it was apparent that the type was still experiencing multiple teething troubles. During the Blue Angels' first airshow appearance in 1953, pilot LT Edward "Whitey" Feightner, the former program manager for the F7U, experienced a total loss of hydraulics on a full afterburner takeoff and steep climb. While trying to gain enough altitude for ejection he was able to stay with the aircraft until the back up system came on. He clipped trees on the end of the runway, causing the left engine to flame out. With hydraulic fluid streaming back in a bright flame, he made a hard turn and got the plane back on the runway, much to the excitement of the crowd. Later, while traveling to an airshow at Naval Air Station Glenview in Chicago, Illinois, Blue Angel pilot LT Harding MacKnight experienced an engine flameout in his Cutlass, forcing him to make an emergency landing at NAS Glenview. Traveling with him, LT Feightner was redirected to make his landing at Chicago's former Orchard Airpark, which had been expanded and renamed O'Hare Airport. The runway had just been completed and was covered with peach baskets to prevent aircraft from landing until it was opened. LT Feightner was told to ignore the baskets and land on the new runway. As a result, LT Feightner's F7U became the first aircraft to land on the new runway for Chicago's O'Hare International Airport. Following these incidents, the two Cutlasses were deemed unsuitable for demonstration flying and were flown to Naval Air Station Memphis, Tennessee, where they were abandoned to become aircraft maintenance instructional airframes for the Naval Technical Training Center.